Or new Newborn seat simply attaches to the top of your Trapp Trapp® - making it suitable from birth and truly a chair for life. Tripp Trapp® Newborn will be available in the UK from late November. Dissapointed to say the least, was hoping you were working on a double buggy as i love my stokke but will really need a double buggy next year or have the hassle of two single stokke`s. 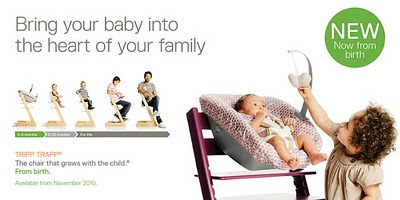 This looks like a marvellous contraption; something I wish we had when Amy was a baby. Now, that is brilliant. We've always just ended up holding the baby at mealtimes, etc. To have her in her own seat at that table, even before she can eat is ingenious. Well done! I wish that had been introduced 6 months ago! I would love to have tried that on our TrippTrapp! Very good idea. I approve!! !